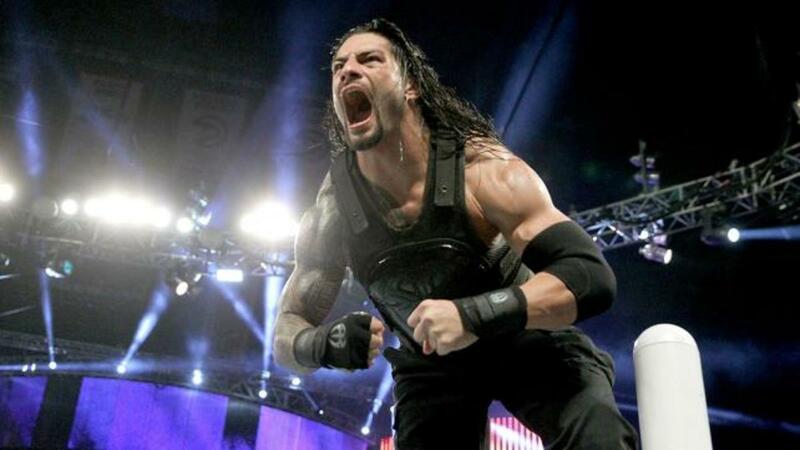 Roman Reigns, by himself, defeated the League of Nations in the main event. Also, they officially announced that New Day would defend their tag titles against the Usos and Lucha Dragons in a ladder match at TLC. As expected, Dean Ambrose will face Kevin Owens for the I.C. Title. After a recap of Raw, Smackdown started with Roman Reigns, Dean Ambrose and Jimmy and Jey Uso in the ring as Reigns’ music played. Reigns asked the crowd if anyone was there with their families. Oh god. He said he was there with his family too, calling the Usos his closest cousins out of many, saying they were like his brothers. Reigns called Ambrose his brother too. A light “Hug it out” chant started so Reigns and Ambrose did a quick bro hug to humour them. Reigns said Sheamus turned to the Authority and the League of Nations, but that won’t help him at TLC because it’ll be one-on-one. Oh really? Reigns didn’t want to wait until then for a fight, so he called out the League (Sheamus, Alberto Del Rio, Rusev and King Barrett). They hesitated but eventually came out to Sheamus’ music. Sheamus mocked Reigns’ speech and the crowd chanted “You look stupid.” Sheamus said he can’t look stupid as long as he’s the champion. The crowd chanted “U.S.A.” and he said they all have their green cards. Sheamus reminded us, again, that Reigns was champion for 5 minutes and 15 seconds. Reigns said they don’t want to hear Sheamus tell jokes, they want to see a fight. Sheamus said they just wanted to be friends with him, but since he figured Reigns wouldn’t want that, he spoke with some “WWE officials” and they made a match with the League against Reigns, Ambrose and the Usos for tonight. New Day came out. They mocked Reigns some more and called him Roman the Ruiner. An Uso told them to shut up and fight. Xavier Woods said they weren’t done talking - they were told by “WWE officials” that Ambrose and the Usos would have to earn their spot on Reigns’ team tonight by defeating New Day first. Big E said if they don’t, Reigns will truly be “one versus all” (mocking his t-shirt slogan). New Day cackled at their own joke forever. That line was funny but this was not a good segment otherwise. Dolph Ziggler, with straight hair and a headband, joined commentary. In an inset promo, Breeze said Ziggler distracted him on Raw and would take out his frustrations on the human troll doll Neville. Neville mocked Breeze early in the match by laying across the top turnbuckle. He almost went for a dive to the outside but Summer blocked the way. Ziggler said he would’ve done the dive anyway. After a break, Neville finally did hit a big dive followed by a running shooting star for a two count. Neville came off the top and Breeze tried to counter with a dropkick, but Neville just landed on his feet avoiding it altogether. The crowd laughed, but Breeze was able to come back with a superkick for a near fall. Neville hit a kick and went to the top but Breeze rolled outside. Summer grabbed Neville’s foot with the referee distracted, allowing Breeze to catch him with an Unprettier for the win. Backstage, Becky Lynch told Jo-Jo that Charlotte is still her best friend and best friends don’t always see eye-to-eye, but she won’t let it get in the way of their friendship. Brie Bella and Alicia Fox joined the frame and called her gullible. Lynch told Brie she should be getting ready to lose to her. Brie spewed some awful dialogue and Charlotte joined the frame to brag about beating Nikki. Brie told her it’s lonely at the top and she’d come crashing down to earth. After Brie and Fox left, Charlotte said she’d be in Lynch’s corner. This was bad, particularly Brie and Charlotte. Brie went down early and began faking an ankle injury. Brie laughed and Lynch, so Lynch dropkicked her in the leg. That was funny. Brie came back with Yes kicks, a dropkick and running knee. They cut backstage and Team B.A.D. was playing with a pinata. They never followed up on this. Lynch came back with a forearm and Exploder suplex. Lynch went for the Disarmer by the ropes, but as Brie pushed her away, Brie accidentally caught Charlotte with an elbow. Lynch was able to apply the Disarmer, but Charlotte jumped in the ring to attack Brie for the DQ. The crowd booed. Brie and Fox left in celebration. Lynch confronted Charlotte who kept yelling “She hit me!” like a damn child. This was awful, even if Charlotte is turning heel. Backstage, a disappointed Neville bumped into The Miz. Miz made a crack about Neville’s ears. Neville wasn’t in the mood and told Miz to leave. Miz said Neville has all the talent but is missing a personality. Miz claimed that was social media talking, not him. Neville asked Miz why he suddenly cares, and Miz responded that Neville reminds him of someone else he took under his wing - Daniel Bryan. The mere mention of Bryan brought cheers and Yes chants. Miz offered to help and gave Neville a copy of his new movie. Elsewhere, Renee Young interviewed Lana and Rusev. Lana, wearing a black dress instead of her usual suit, accused Ryback of purposely pushing Rusev into the steel steps to injure her. Rusev called Ryback a coward and would crush him. They kissed. After a break, New Day worked over Ambrose. They cut backstage to Reigns and he acted concerned. Ambrose hit a rebound clothesline and made a hot tag to Jimmy Uso. Jimmy and Jey hit running hip attacks to Woods and Kingston. Big E tossed out Jey and Ambrose took out Big E with a missile dropkick. Ambrose tried a dive but was caught by Big E, so Jey knocked them both down with a dive. Jimmy hit a superkick on Woods and went to the top. Kingston tried to interfere, so Jimmy jumped onto the apron, tweaking his previously injured knee. Kingston kicked his leg out of his leg and Woods followed with shining wizard for the win. Huh, New Day basically won clean. Good match, although I’m not a fan of Ambrose being on the losing end of random matches. They cut backstage to Reigns and he acted disappointed. Bray won with a Sister Abigail. This was one of the matches where the babyface gets a lot in a quick match but loses abruptly. Afterwards, Bray picked up D-Von and threatened to use his finisher again, telling Bubba and Dreamer to stay where they were. They backed off as the Wyatts grabbed a table and set it up in the ring. Bubba and Dreamer then grabbed Kendo sticks, jumped in the ring and attacked. They seemed to have the advantage but Strowman broke a stick over his knee and took out Bubba with his standing choke. They put Dreamer through a table, piled up the dead bodies and posed over them. Bubba and Dreamer hesitating to get in the ring came off poorly, but this was fine otherwise. After LON made their entrances (individually), they cut backstage to Reigns who was joined by Ambrose and the Usos. The Usos blamed themselves for the loss, saying they let him down. Ambrose said they’d be at ringside anyway. Renee Young chose that moment to approach them and break the news that they were banned from ringside, per certain “WWE officials.” Ambrose and the Usos were pissed, because they chose to believe her even though she’s not actually in charge. Reigns said he would be fine. After a break, they worked over Reigns, including Rusev using a nerve hold on Roman’s vest. Rusev tossed Reigns out of the ring and distracted the referee, allowing Sheamus and Del Rio to get in a few shots. They had the heat forever until Reigns hit a Samoan drop on Rusev and made his usual comeback on Del Rio (after Del Rio missed hilariously on a running enziguri). Rusev tried to interfere but Reigns caught him with a superman punch. Del Rio hit a back cracker and went for the armbar but Reigns slipped out and hit a spear. He had the match won but Sheamus broke up the cover. Reigns ducked a Brogue kick and tossed Sheamus to the outside. Reigns hit an apron dropkick on Rusev and jumping clothesline on Sheamus. Reigns tossed Rusev over the barricade and Del Rio onto the announce table. Reigns jumped back in the ring right before the 10 count and picked up the count out win. After the match, Barrett made his way down the aisle. Reigns called him into the ring, but Sheamus caught him from the side with a Brogue kick. They attacked Reigns but Ambrose and the Usos ran out to make the save and the League bailed. Reigns miraculously recovered from the Brogue kick and said the title would be his. The crowd was into Reigns’ comeback, although it wasn’t a huge reaction. This show was was all about getting Roman Reigns over, as most shows will be from now on it seems. The main event was laid out well in that regard, especially the end. Count out wins tend to be dissatisfying, and maybe this was, but Reigns still laid out four guys on his own and won. Unfortunately, whoever is in charge decided getting Reigns over meant sacrificing seven other guys. You can rightfully complain about the League of Nations losing to one guy on their second night as a team, but we all know they don’t really matter. They exist to get Reigns over. It bothered me more the way Dean Ambrose and the Usos were handled. It’s cool they’re protecting the New Day, but I’d rather they not drag Ambrose down to the mid-card. More than that, they looked so weak after not only after losing, but listening to orders being delivered by Renee Young, an interviewer/reporter. Not only was the Authority not present, but Renee said they were banned by “WWE officials,” which means nothing to anyone watching. Basically, it felt like nobody was actually in charge. Why would Ambrose and the Usos obey orders handed down by some unknown entity? What are all of these good guys so afraid of?